Invented Landscapes of Coney Island and Carnival Workers. 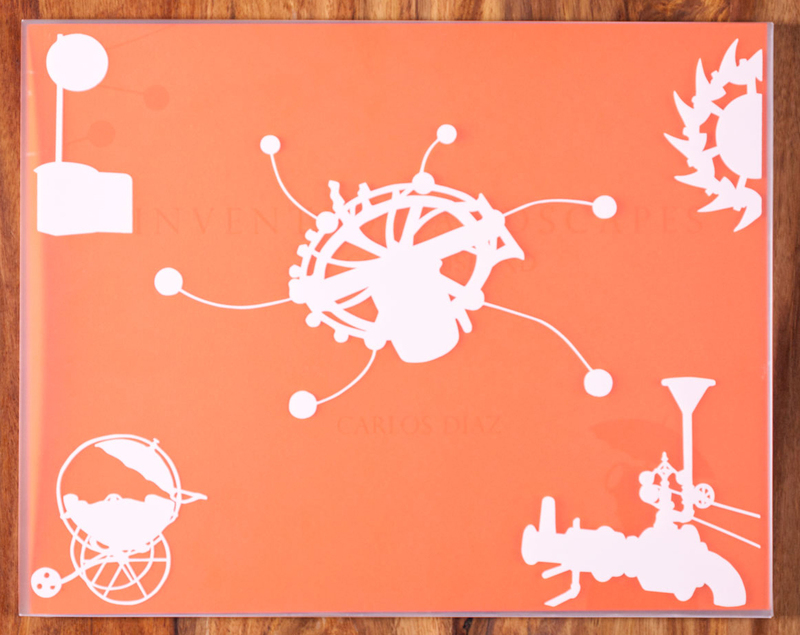 Artist's book with photographs, collages, and statement by Carlos Diaz. Essays by A.D. Coleman and Mary McNichols. Obscura Land, Detroit, USA, 2018. In English. 112 pp., 55 plates, 12x9". Carlos Diaz’s early 1980s carnival worker images and his Invented Landscapes are brought together for the first time in a beautifully presented volume published in 2017 by Obscura Land. Diaz’s Invented Landscapes work spans three decades, starting with images he captured in the early 1980s at Coney Island in New York City. Although in today’s world one might think these images were generated digitally, Diaz began creating the Invented Landscapes a decade before photographic imaging software was on the scene. The original collages combine silver halide prints with vintage nineteenth-century industrial engravings that he painstakingly cut by hand from books and other printed materials. He then carefully integrated the drawings with the photos to create these fantastical images. The book includes essays from renowned photo critic, A. D. Coleman, and historian, Mary McNichols, PhD, as well as an artist statement by Diaz. There are a total of fifty-five plates in this book: thirty-three Invented Landscapes, eleven carnival workers, nine postcards from early-twentieth-century Coney Island, and two reproductions of original Coney Island tickets. The book has unique features that make it a work of art in and of itself. The first thing to note is the trade edition's translucent vinyl slipcover printed with solid white silhouettes of the nineteenth-century engravings. The cover of the book is a bright orange, archival Plike paper that has a great tactile feel. The title and selected silhouettes are spot varnished to appear like a watermark on the front and back cover of the book. All of these features make the book inviting and pleasant to hold in your hands. 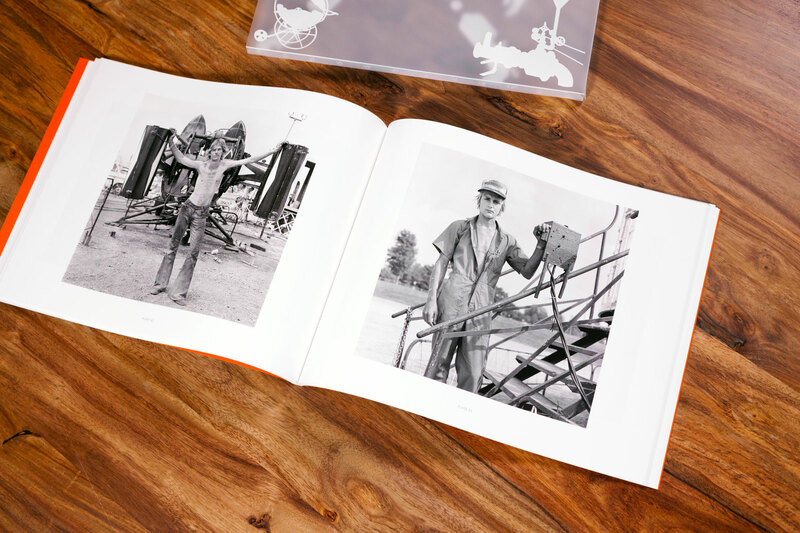 The inside pages of the book are coated with a matte finish, which allows the original black-and-white photographs of Coney Island to pop with a subtle glossy finish. This allows the nineteenth-century engravings to appear matte and the photos to appear glossy—just as the original collages would if you were looking at them in person. Includes a copy of the book with a single 10½ × 7½ inch archival photographic print of an Invented Landscape. Deluxe Edition of 25 Signed & Numbered Clamshell Portfolios. Inclues a Japanese hand bound book with a Print folio of 7 large archival inkjet prints.